A word Biryani makes everyone “Awake” and that’s especially to South Indians. We have all varieties of Biryani’s available in Bangalore. The most popular is always a Hyderabadi & Awadhi more than other Biryani’s. It’s always a happy moment for every foodie to see a new restaurant in the town. If that’s a Biryani Place, no doubt it’s going to be a Priceless moment. It was a fun filled Sunday at Paradise, New BEL Road Bengaluru. Well Paradise started their new outlet in New BEL Road on 16th January 2016 and invited the members of #fbab for a lunch on 17thJanuary’16. Being a member of FBAB, It’s always a pleasurable experience to spend time with foodies. This time I could see lots of new faces and that’s truly because of a Brand Value which paradise has got. My Trip will not finish without a Paradise Biryani, whenever I visit Hyderabad. I have a relationship with Paradise from a Decade! 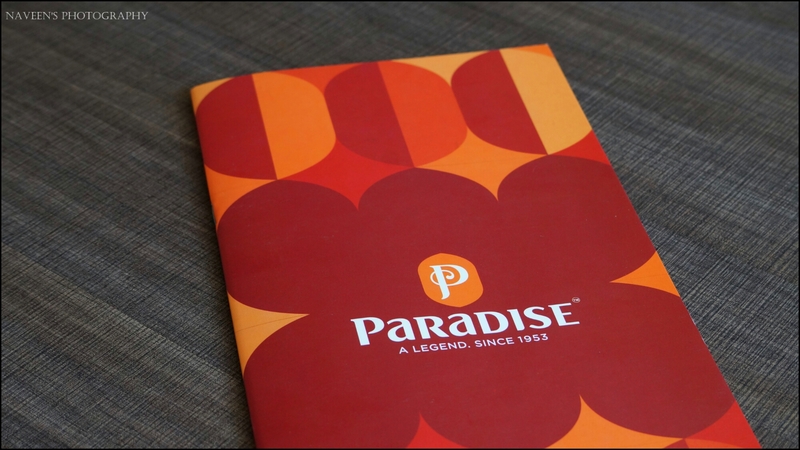 I am one of the happiest customers of Paradise in Both Hyderabad & Bangalore. I also visited Paradise Indiranagar within few weeks of the Launch and overwhelmed about everything except the spice level of the Biryani. The spice level is reduced to suit Bangalorean’s Palate. Well, Paradise New BEL Road outlet along with #fbab invited few food lovers & bloggers to try the food at their newly opened outlet. Paradise, New BEL Road is a pretty huge outlet and easy to pin-point, if you have at least knowledge about the locality. The Name Plate is visible to almost 100 meters, that’s made my life easy to reach this Place without hassles. During my visit, the place was properly decked, since it was a day 2. The place has got a seating area, both at ground floor & first floor with comfortable, ultra-modern casual seating and the décor showcase the feel of the Old City in Hyderabad. The main attraction along with the food is, Photo Frames of the celebrities who love & adore the food at Paradise. A dedicated Table which can accommodate 15 people was reserved for us and we got an opportunity to interact with Chef as well, that’s something rare opportunity in places Pa Paradise. They served most of the Veg & Non Veg dishes from a Menu and we also had an option to choose anything from a Menu. Being a Vegetarian, I hardly see 3 Vegetarian Kebabs like Paneer Haryali Tikka, Subz Aur Moongphalli Seekh and Paneer Tikka, which are again tremendous. In Chinese Starters we tried Veg Manchurian, which is again good; I hardly see good Chinese dishes especially in an Andhra Style Restaurant. Nevertheless, Paradise got full marks for it. Paneer Haryali Tikka – The first impression was brilliant, because of green chutney based coating. The Paneer was marinated perfectly and tastes divine. Since my tongue enjoyed the flavor of it. The Paneer was again super soft without any complaints. Subz Aur Moongphalli Seekh – It’s a Vegetarian Version of Sheekh Kebab. Paradise did a great job in placing this dish on the menu. I liked the way it was presented. The dish coated with a lot of Peanuts and I felt a little dry after a couple of Bites. However, Green Chutney will be your savior by giving some moist along with the extra spiciness to it. Paneer Tikka – It’s again marinated perfectly and little spice level could have done better. However, the dish will not disappoint non spicy food lovers. Veg Manchurian – The Manchurian Balls are uniform with good texture. It was piping hot while serving! I totally adored it. The Paradise serve Mutton Biryani, Chicken Biryani & Veg Biryani – Yes, Veg Biryani is something I love anytime by Choice. Veg Biryani – The Paradise serves Decent Veg Biryani. The Rice loaded with medium spice gravy kind of flavorful masala. The complete dish is flavorful and it’s a divine feeling with the Thick Mirchi Ka Salan & Garlic Infused Raitha. I had the same Biryani in Indiranagar and I dint liked much because of the spice level. However, I see lots of positive changes here, which is commendable. Our meal ended with few popular desserts! Qubani ka meetha – The dessert made out of apricots and I felt too sweetish! I am sure; one cannot finish the complete portion. I would prefer trying with Vanilla Ice Cream! Double ka meetha – Another popular dessert of Hyderabad and made out of Bread! The bread was soaked perfectly in spices. I could sense the flavor of Cardamom! A must try dessert if you are in Paradise. Gulab Jamoon – The Gulab Jamoon was uniform, soft, flavorful and soaked perfectly in Sugar Syrup. It was perfect I would say! The place was jam-packed during my visit and could see 30 to 40 people were waiting for a table, that’s shows, a positive sign about the place. The Service was extremely good! The folks were very quick & handling things accurately. The people who work at Paradise are experienced and knowledgeable though! Group Picture of Complete Gang! Paradise is always an apt place to go with family & friends for Biryani anytime! Address: Vacuum House 1, Chikkamaranahalli, New BEL Road, Bangalore. Previous Post 67 Years Old Restaurant arrived to Namma Bengaluru – Pindi Bangalore, HSR Layout, Bangalore. I blog frequently and I really thank yoou for your information. This great article has really peaked my interest. I am going to take a nlte of your site and keep checking for new details about oncce per week.